After each of our Vermont retreats, we offer an extra gift bag as a giveaway to readers. Our generous friends and sponsors sent the prettiest things to share with you. Please visit their sites and shops and consider your holiday shopping lists while there. To enter the giveaway, leave a comment on this post and one winner will be chosen next Friday, October 31. We are planning our next pair of retreats, May 28 - 31 and also June 4 - 7. Save the date(s)! Details to come. From Melissa Schulz, a custom-crafted charm necklace. One side says MAKE, the other says CRAFT. 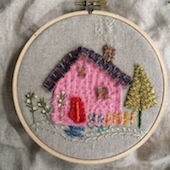 From Dimensions, a stitch kit designed by our friend, Amy Powers. From Jone Hallmark, a tiny handcut paper banner to unfold and hang or use in a journal. From Prairie Point Junction, a selection of wool felt squares to cut and stitch. From Mary Engelbreit, an illustrated holiday journal and pen. From Rebecca Sower, a packet of journal bits to dress up a page or project. From Tammy at Wing and a Prayer Farm, a needle-felted acorn from her wool fiber flock. Thank you so much to our sponsors and to all of you for visiting, commenting and expressing an interest in our craft retreats. We enjoy it all so much! Write to us at fallvermontgetaway@gmail.com. Spring in Vermont is gorgeous and we have lots of fun planned already!